In its long history, the Golden Fox had celebrated many jubilees, yet the following one on 1st and 2nd of February 2019, will be one of the most remarkable. Namely, this will be the 50th anniversary of hosting World Cup in Maribor. First Golden Fox competition for ladies that was world ranked was organized here during 17th and 18 of January 1970. That year, which was the 7th Golden Fox edition, Austrian Annemarie Proell emerged victoriously in giant slalom. This was first of many wins in the World Cup races for Annemarie Moser Proll who is recognized as one of the best alpine skiers of all times. In slalom event the winner was American Barbara Cochran, who also took first place in combined event. 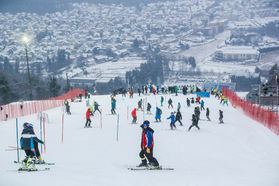 Since Golden Fox’s 50th anniversary could not be celebrated in Maribor ( in 2014 it was forced to move to Kranjska Gora, where giant slalom event was canceled and slalom was successfully carried out despite of sleet that crippled entire Slovenia) this time around the celebrations will be all the more ceremonious.